For Dino Alves the most important thing was always the truth and that’s the statement he passed on his last show at Lisboa Fashion Week FW 17. Having this in mind WAM Magazine talked to Dino Alves to find out more about him and his last collection “Manual de Instruções” (Instruction Manual). I always felt that I had a connection with fashion for my way of being in life. But I never decided to go to the fashion area, I never decided to be a designer. Actually when I had to choose I chose to be a painter also because at that time fashion didn’t have much of the artistic side it has today. But I always had fashion in mind since I was a kid because I don’t think it’s just about combining a pair of pants with a shirt, it’s more than that. Fashion comes from the inside, you need to have style, otherwise you can try all the clothes and it won’t work. Do you feel like you’ve ever walked through life mistaken? I was mistaken about other things but never about this. I made sure I always kept faithful to what I think is the truth. That’s why I don’t have any partners. I know that if that happens it will have to be with a person like me who gives primacy to the truth. I also feel that the trigger point for me was believing year after year that things would change but the years passed and nothing changed. I looked at the things I used to do when I started and it was clear to me that I did those things without being aware. Of the costs. Of the time it took. Of everything. I still feel fulfilled now doing what I do but I feel I had more freedom before. It was insane but at that time I only thought about my desire to create. Now I still want to feel free but I can’t be as unconscious as I was 10 years ago. I give a lot but then I don’t have much return. The best return is to have a few people in my life with whom I really have a true connection and of course the title that no one can take away from me: the title of Portuguese’s fashion “Enfant-terrible”. I constantly say I get inspired by life and by people. Even when I pass by the street I see something that at first might not be that relevant but it can be the starting point of something. Nowadays I definitely get more inspiration from people and social causes. I never got my inspiration from a movie or a piece of art and although I’m not really a political person I think that what I do turns out to be political because I don’t feel fulfilled with just the design. That’s something most people are able to do. So I want to do more than that. I want to react to something through fashion. In this specific collection what was your inspiration? My inspiration was the fact that there is a discrepancy between the enthusiasm of going to a show and then how this enthusiasm is actually reflected after. Because in the end how many people that goes to the show actually end up buying the pieces and demonstrating a real interest? In Portugal there aren’t designers who have 400 or 200 clients, that doesn’t exist here. That’s why during Ana Bola and Maria Rueff’s presentation of the show I made clear that in that room I only had like 5 or 6 direct clients. Although people assume my pieces are very expensive without even trying to know the real price I also had in consideration that nowadays there isn’t much purchasing power. That’s why I made a collection without locks, buttons and this wasn’t because these items are expensive but because of the time it takes to apply them. Therefore, I reduced the effort to the minimum. All of this has it’s funny side because people have no idea of how much it costs and people who say “I was expecting more from this collection” are the ones that usually understand this the least that’s why I felt like saying “Really? Do it yourselves then” and this was highlighted in a funny way in the presentation. This is a message that concerns all designers. I was just the spokesperson of them all. So I’m really happy that now after the show I can feel the support of my colleagues like Ana Salazar that is without a doubt the mother of Portuguese fashion and others like Nuno Baltazar and Valentim Quaresma. This is one of the reasons I wanted to grab this statement I made and make it theirs too. Make this for all of us. Because the difficulties I have to go through are the same for them. What advice do you give to the designers who are just starting out? I think that the way to go is for people to be original and don’t go after anyone’s ideas. People should just follow their own ideas and remain truthful to who they are. I’m totally certain that that made like 80% of my success. People need to make sure that their work passes their own truth because everyone can see when something isn’t authentic. Are there any professional goals you think you haven’t reached yet? What I feel on a professional level is that I should not have to work this hard to achieve things and with that I’m obviously not saying I don’t have flaws but this is what I want the most. I feel that I have ambition but I’m not a materialistic person. I really cherish the people who have been with me in this journey and I know I was able to pass a good energy to them and make a real connection. This human side is surely one of the most important aspects in my professional life. 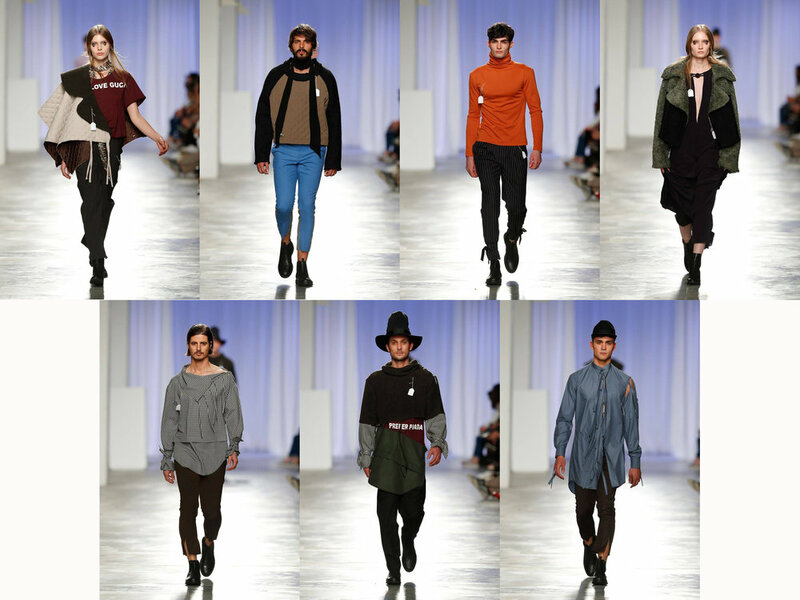 What do you think about the current national fashion scene and its future? Honestly I’m not sure because the main thing here is that we are in Portugal and it’s not a big country so obviously there is a larger artistic expression in other countries and a greater impact. That’s the major difference for things being much harder here than in other places. Despite that I see my colleagues’ shows and I feel that most of them really are as good as other international designers. There is not a lack of creativity but we’ll never be a country focused on fashion although this might change in the future. Another thing is that for us to go abroad we need to have a structure in those countries and this is something that, in the last instance, needs support. So for the future let’s hope this changes and people don’t just settle down. 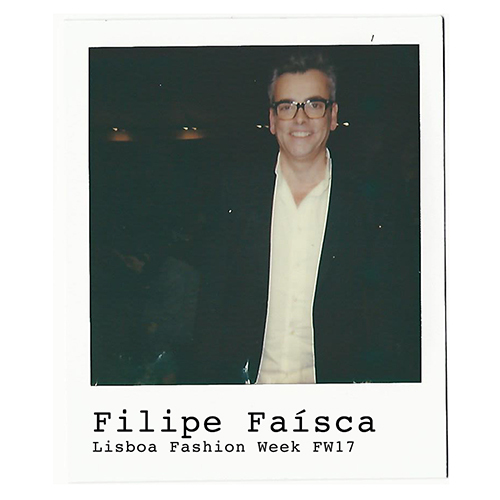 WAM Magazine went to Lisboa Fashion Week and got the chance to interview Filipe Faísca, an inescapable presence at portuguese runways. Take a look to get to know him better and to see what he has to say about “Caleidoscópio”, the last collection he presented at Lisboa Fashion Week Fall Winter 17. I get inspiration from the world and the universe itself. It’s always inspiring to go out and to feel the energy that surrounds us. Besides that I get most of my inspiration from travelling. It was the speed with which life passes by today and having that in consideration we need to realize that there is neither time nor space. We are living a life of plurality and a mix that in fact has always been part of Lisbon since the 14th century where the trade increased. So nowadays a woman’s wardrobe has to be efficient and therefore we worked hard on this trend that is related to sports which is something that currently everyone talks about. But we worked this trend in our own way with our House’s DNA. It’s all about the details, the manufacture and handcraft. That’s why people can see a sportswear line that is well thought out and with many finishing touches. The advice I give is that they should have a lot of persistence and willpower because it really takes a strong will and a true pleasure for doing this to get somewhere. Of course, I think I still have to reach industrialization because I’m just an atelier that makes pieces one by one. What do you think about the current national fashion scene? My view of the national fashion scene is wonderful, I think it’s boiling. But like I said before it’s important to be aware that fashion in its manufacturing side is a really precious thing like making furniture, watches and jewelry. It’s so meticulous that you have to be very careful with it.